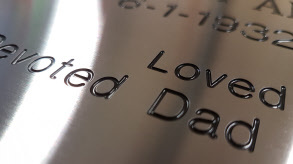 Whether your require personal, commercial or industrial engraving, Benchmark Engraving & Awards provides a reliable service with an emphasis on quality of finish for the work we produce. 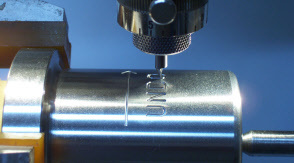 All of our engraving is done with high precision computer controlled engraving machines. Stainless Steel, mild steel, brass, or aluminium panels and components can be engraved or etched with optional paint fill to produce a variety of finishes. Engraved stainless steel panel. The lettering is cut into the metal making it permanent. 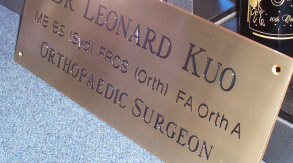 Traditional engraved brass plaque with the letteing cut into the metal and paint filled with black enamel. Engraved marine grade stainless steel memorial plauqe with black enamel colour filled lettering. 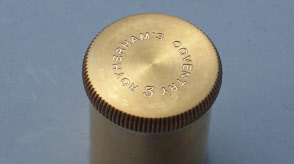 We can also engrave cylindrical shaped items. 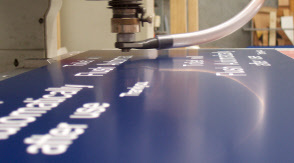 This photo shows usage instructions being engraved onto a round steel machinery component. 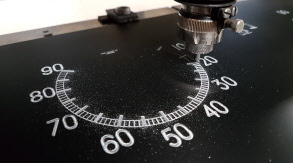 Making a replacement speedometer dial for a vintage car from black anodised aluminium. 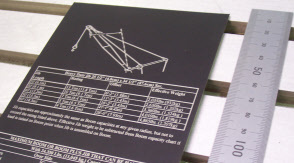 Durablack industrial metal sign panels, corrosion resistant. Can be laser engraved with very fine detail. 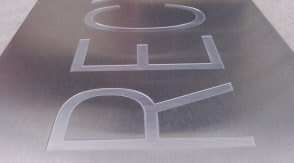 Laser engraving can produce very fine detail onto stainless steel. Engraving on the end of a brass machinery component. Surface etched and painted text on a metal garbage bin lid. Labels and signs can be produced in a variety of materials such as various metals or plastic, colours and shapes, and can also be supplied with self adhesive on the back. Different materials are also available for indoor and outdoor use. Contact us with your requirements and we'll be happy to provide a recommendation on the best material and prices. We keep a large variety of materials in stock and using different engraving techniques can produce a variety of finished. Our computer operated machines can be setup to produce individual items, or bulk orders, and produce a perfect finish every time. 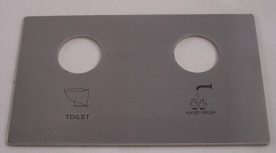 Engraved brass utility labels can be custom made to your specific requirements. 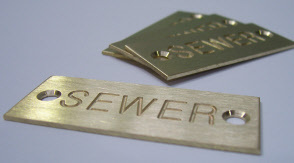 Engraved brass labels are corrosion and abrasion resistant. We stock a large range of office door signs. 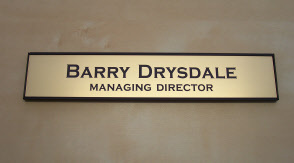 The above example shows a brushed gold name plate in a black aluminium frame. The name plate slides out of the frame if it needs to be changed. 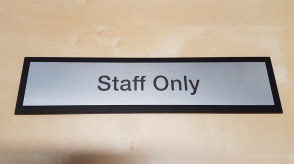 Brushed aluminum coloured sign panel "Staff Only" mounted on a black acrylic backing board. A simple design that looks professional. We can make these to any size with any wording. 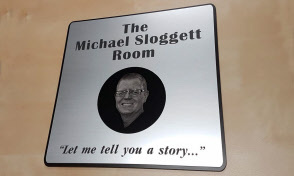 Custom made meeting room sign with a brushed aluminium finish and photo engraved black metal insert. We often get asked for Traffolyte labels as this was the common material used to manufacture engraved labels for many years. 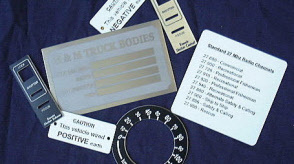 Genuine traffolyte was discontinued many years ago, and has been replaced by much larger range of modern engraving materials offering a much larger choice of colours and finishes. We still have a small quantity of genuine traffolyte in stock for anyone needing to match some older existing labels. However for most situations the new materials such as Rowmark, Gravoply or Trotec will provide the best solution. Best of all the new material still looks similar to the old traffolyte. 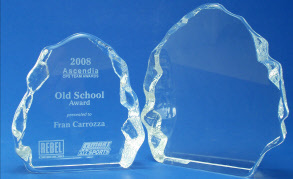 We can etch glass for decoration, identity, trophies & special awards. 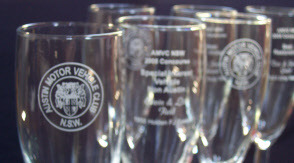 Etched glassware looks very upmarket, is ideal for special events and also makes a great alternative to a trophy. Glass and crystal trophies can be custom engraved to suit any occasion or event. 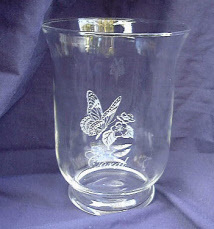 Glass gifts can be engraved with a personal message or theme.